Put Oreos into a food processor and pulse to a fine powder. Set some aside for garnish and mix the rest with cream cheese in a large bowl. Roll the mixture into balls with your hands, placing them on a wire rack. Chill in the fridge for approx. 30 min. Meanwhile, melt the white chocolate over a double boiler. 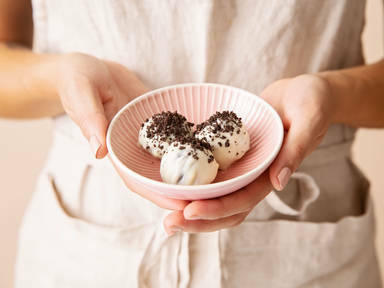 Dip the chilled Oreo truffles into the melted white chocolate and lay back onto the wire rack with a piece of parchment paper underneath. Sprinkle with remaining ground Oreos, chill for approx. 30 min. or until chocolate is set, and enjoy!